I can't even tell you how excited I have been for this giveaway. I don't remember the last time I saw something this innovative, fresh and just outright cool. The styling of the pictures (view more here), the jewelry itself, I could stare at it all day long. It makes me happy just thinking about it. You'll find the etsy store stocked full of design after design of nature inspired goodness. Each comes packaged just like a bug display and the names (though most I can't pronounce) make me love the line even more, so much so, I find myself wanting to surprise everyone I know with a PHYLUM KINGDOM piece just so they can experience the wonder for themselves. I've been dropping hints to my husband for Valentine's day... I'm hoping he's picking them up. Here are just a few of pieces I would love to have. Vegrandis vigeo earrings, Pyrrhia umbra necklace, Cuprum cerule earrings and the Aphelion vitum necklace. Each piece makes a statement without screaming "look at me" and isn't that exactly how jewelry is supposed to be? Todays winner will receive the Acerglabrium orbis ($42) inspired by old tree rings, the wood hangs suspended from nylon copper wire, 26". Which PHYLUM KINGDOM piece is inspiring you? Those poppies are calling my name! I'm loving the Terrus pyrita. Simple and beautiful. Love it all. Poppie earrings included. This is a very difficult decision! 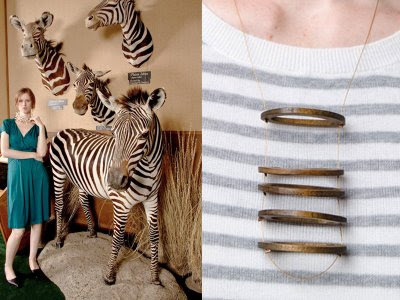 I'm diggin' the Terrus pyrita necklace! I love the orginality behind these pieces. the earrings are inspiring to me... they remind me that spring will come again! 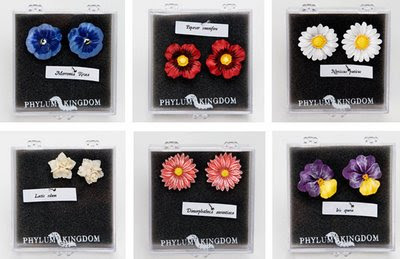 I'm not entering because I won a phylum kingdom giveaway on a room somewhere right before Christmas--the red poppy earrings--and they are the cutest things EVER. I feel so cute in them. Love Phylum Kingdom. I love the Brundisinium filum earrings. So gorgeous!!! The Astrum explodere earrings are so fun. The Pinctada albina is simply gorgeous! These pieces are so fashion forward. This artist is very current with the bold statements that are on the runway right now. 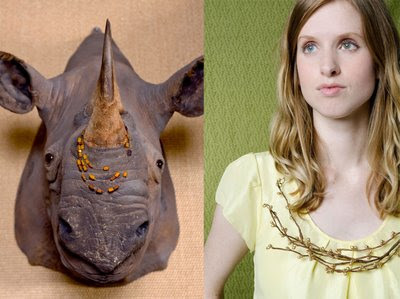 I especially like the Pinctada albina necklace and the Sericum sepala bracelet. Gorgeous! As a bio major in college I am totally digging all the pieces but especially Altocumulus Tempestae - so cool. oh my gosh, that Rami aurum necklace is breathtaking! i'm pretty sure i just HAVE to buy that. The Terrus pyrita necklace is really unique - love it. what great, unique jewelry... i love it!!!! Fun little things. Very creative. I really like the necklace terrus pyrita... it was my fav! I love all the earrings. I love the cuprum cerule earrings. Very unique and cool. What awesome jewelrey!! The red poppy earings are SO cute! I love them! love the Cuprum cerule. so unique and one of a kind! castanea frutex, terrus pyrita, aphelion vitrum are all so cool. Thank you so much for introducing this amazing etsy shop! I absolutely love the Pinctada albina it is so natural yet so elegant! i love pinctada albina. phylum kingdom has amazing stuff! Celeste, Chloe, and Gloria are all the same person and should be disqualified for cheating. Orae pollen earings are cute! Wow. How awesome. I think my fave are the earrings in the bottom right corner. I can't quite see the name on that one, either way, they are the little white ones. They're gorgeous! Aphelion vitrum, please! What fabulous pieces!! Love it! Love the Cuprum cerule! Gorgeous! I love the Aurae Pollen earrings -- simply beautiful. I think everything is sweet. I really like the poppy earrings though. Great giveaway, Thanks! I love the vegrandis vigeo, the details are so lovely. I love the Cuprum cerule earings. Love the copper! I love the Aphelion vitrum necklace! The red flower earings are lovely. I love the Pyrrhia umbra. really its just so hard to choose because I like most of them. I'm not sure this is my style, but I'd LOVE to try it! I'm diggin the Aurae pollen!! i love the grndis vigeo!!! Very Hip. The Rami Aurum necklace is stunning. the Terrus Pyrita is just my style- perfection! oh, wow. i *heart* Cuprum cerule. what a statement. love the fact that they are a slightly mismatched pair. they would certainly brighten up my dark winter days!!! Just gorgeous. My favorite is the Rami Aurum necklace. I think it might attract squirrels. I LOVE the Astrum explodere earrings, I think I would wear them every single day. Thanks for the fun site! I need the poppy please! I love the Aphelion vitrum necklace - just beautiful! I really liked them all and it was hard to find just one that inspired me. I really did like the Altocumulus Tempestae necklace. It is so dramatic and can dress up even the plainest of t-shrits or tank tops. WOW - so neat and new! I love (among others) the Pyrrhia umbra ! I've never heard of Phylum Kingdom but I am loving it all. Thank you for the introduction. This would be so fun to win!! I seriously love the Castanea-Frutex necklace! It is too yummy! I love the oxidized earrings that go from teal to gold. Gorgeous! 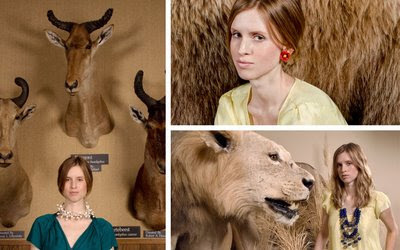 I was lucky enough to be a part f Adirenne's vision and shot the photos in the taxidermy museum! I love her work! So Many beautiful pieces it's hard to decide! But, I'll have to vote for Castanea-Frutex. Ha ha, this one really stretches my spelling skills! I really like the Pyrrhia umbra---lovely color! So many gorgeous pieces! I love the Pyrrhia umbra--so elegant! Thanks! I love the Rami aurum! I looked over these all twice and tres and still its the Rami aurum. Aphelion vitrum is my favourite. Holy smokes! I had an idea like this in high school with all the genus/phylum. I love it! The Pinctada albina is my fav. Love it! pretty! love the photography on the etsy page... i'm really digging the Castanea-Frutex necklace. it reminds me of upscale pieces like marni! I like the Altocumulus Tempestae best! Thanks! My favorite is Aphelion vitrum its gorgeous. I like the Castanea-Frutex necklace for the same reason I like the "tree ring" thing you are giving away - the wood natural look appeals to me. I was a child in the sixties with a pink bedroom just dying to have earthtones - ha! Now I have earthtones in my whole house. I love how interesting and unique-looking Terrus pyrita is, it's definitely my favorite. man I'd love to win this!! earrings. Eagles are so beautiful. Thank you so much! Omgosh, I adore the Pinctada albina! I'm obsessed with the albina necklace and the pollen earrings! Wow! i love all of the earrings! oh wait...and the necklaces. I love the Rami aurum! I can hear Victoria Falls in the background, as I view this very exquisite jewelry-art! I like Kyla Jane, but then again I just love Butterflies. This jewelry is so unique and fun. I love all the earrings. I like the cocus loxondonta! it's hard to choose a favorite they are all great!!! Amazing styling on every single image! Do I really have to choose 1 favorite?!? Then I choose the Acerglabrium Orbis. Can't go wrong with anything inspired by nature. I admire Phylum Kingdom's "Malacosoma Disstria." I love the nifty texture and shapes. Thanks for the shopping tip! Earrings tend to be my favorite. So I really love Lactis solum, Papaver somnifera, Narcissus poeticus, & Merremia rivea. (Haha, basically all of them.) But the most INSPIRING piece, for me, is the Rami aurum! It looks like it was picked in some magical forest where bears aren't scary & branches are golden! Thanks for such a cool contest. I am so inspired by the the Siccus Hortas Press Flower Earrings! So aesthetically beautiful!